Excuse us, kind Frenchmen. We Americans can be haughty. We can be delusional. We can be accusatory, and we love laughing at you while ignoring the outrageousness of our own situations. We sat here for the past week or so, high and mighty in our sports ivory towers, ridiculing the Tour de France, which concluded with numerous doping scandals and a heavy cloak of embarrassment. de France after 16 stages. Understand that it's very easy for American sports fans to thumb their nose at the Tour de France and find great pleasure in the unraveling of an international event, especially when our homeboy Lance Armstrong is no longer involved. How on earth could a clean man dominate a sport riddled with this many dirty riders? Anyway, we'll save that conversation for another day. For now, let's stick to the American hypocrisy of lambasting a sport and a country for doing far more to clean up sports than we do. What Americans would never, ever want to do is what cycling officials did. We would never want to let a band of doping experts loose on American athletes. We are far too comfortable being entertained by dirty athletes to want to see any real cleansing take place. Just imagine if the same vigilant testers used in cycling set up shop in American pro sports leagues. How many times would we read about American athletes being busted for performance-enhancing drugs on the ESPN crawl? That's an uncomfortable discussion. That's why despite the blustering and grandstanding with all the major sports leagues on Capitol Hill, they would be unlikely to sanction a universal system that would require random testing of pro athletes' urine and blood. 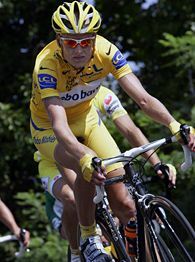 Michael Rasmussen, the Tour de France leader after Stage 16, dodged drug tests prior to the Tour, leading to his team sending him home. I can only imagine how creative NFL players would be if they knew they would have to test clean before the playoffs and Super Bowl. 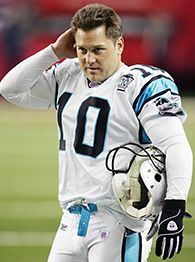 was implicated in the Carolina Panthers steroid scandal. Had the NFL had the same rigorous testing as cycling, the Carolina Panthers might have showed up for Super Bowl XXXVIII a little shorthanded. As it turned out, several Panthers reportedly used performance-enhancing drugs during the 2003 season, and two of them allegedly had prescriptions for steroids filled right before they appeared in the Super Bowl. And while we can make all the jokes we want about Floyd Landis, last year's Tour champion, the most glorified record in American sports is on the verge of being shattered by a man with numerous ties to performance-enhancing drugs. Tour officials already don't recognize Landis as the champion and are pushing the United States Anti-Doping Agency to strip Landis of the title. Bud Selig wishes he had such an option with Barry Bonds. Last year, the most feared defensive player in the NFL -- which only happens to be the most powerful sports league in America -- was suspended four games because he violated the league's steroid policy. The dirty Tour de France cyclists were expelled from the event, and some were fired from their teams. But Shawne Merriman still played in the Pro Bowl and every sack he has earned still counts. And yet with a straight face some of us refer to cycling as the dirtiest sport in the world. That's rich. There is no way American sports are any cleaner than cycling. In fact, if our sports were held to world anti-doping standards, the cycling's scandals would seem mild by comparison. Americans love to be entertained, often at the expense of our judgment, morals and values. We don't want to know what lies behind the performance-enhancing trap doors. Cycling officials have at least been brave enough to want to lift the mask. Knowing that cleaner sports would mean decreased competition and decreased fun, many of us gladly accept the tradeoff of a little dirt. We can continue to harshly criticize the Tour de France, but its officials wanted to know the truth, even if it meant shaming the sport before the world. So the question shouldn't be what has gone wrong in cycling, but rather what's gone right. Page 2 columnist Jemele Hill can be reached at jemeleespn@gmail.com.